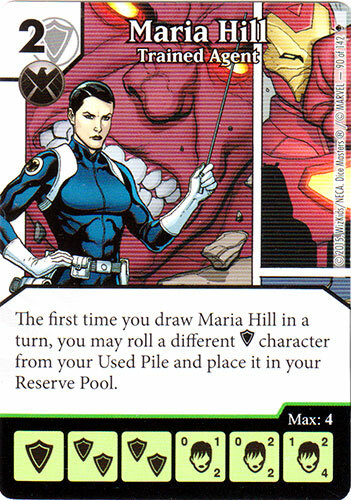 The first time you draw Maria Hill in a turn, you may roll a different character from your Used Pile and place it in your Reserve Pool. I was playing with someone using this card recently and they wanted to use the ability when they drew her, whether she was active or not. Based on the ruling of Rare Sinestro, and a few other card discussions, I said that she had to be active to use the ability. We played it that was for the rest of the game. Today we discussed a ruling about the Thanos SR that basically says even though it doesn’t explicitly say so, his ability works whether he is active or not. I think we played correctly with Maria Hill, but with these conflicting rulings, I can’t be sure. Do we have to wait for an official ruling from WizKids or is there anything else to cite? The rule of thumb is that characters must be fielded for their abilities to be 'on', unless otherwise specified in the card text. Thanos is an exception to the rule. I agree with both of you, but couldn't he argue that Maria Hill is an exception too? Thanos wasn't, or at least we weren't certain he wasn't, until the ruling was issued. I really appreciate the quick responses and your time. I have played her, assuming that she didn't need to be active for her ability to trigger, and it's STILL hard to pull off most turns. I would wager they would make an exception for this ability as well. We will see though. Both of the other Maria's are good, maybe this one was just designed to not be. Once you start down that road you can say that any card is "an exception to the rule". It is, therefore, better to assume the rule of thumb applies to all cards until and unless WizKids state otherwise on the rules forum. Oh I understand, However, This is the first reference to a "when drawn" ability other than swarm, AFAIK, and is thus a precedent all on it's own. If this is meant to be an alternate Swarm affect, that would be interesting, but it is VERY DIFFICULT to draw a die, have a die fielded, and have a die in the used pile, just because fo the standard sequence of play. There's no opportunity to PUT a die in used, after refilling your bag mid draw. Oh, yeah, I absolutely agree. And I also think this probably will be ruled as another exception to the 'must be fielded' rule of thumb. All I'm saying is that it is better to assume it is not until we have confirmation that it is. Well I submitted it to Wizkids for whatever it's worth. I guess we'll just wait and see. If she doesn't need to be active, she actually works pretty well for a few reasons. The person I was playing was using unblockables like War Machine, Namor, and Angel, so it would have come in handy pretty quickly. Hah, I've been playing this Maria Hill as if she works without being active. She almost never procs even in this case as Shadowmeld stated, so it's pretty moot. They should rule it this way if only to keep this card interesting. In my area she is played as soon as she is drawn. I was wondering about that. I'm guessing that wizkids never did give you guys an answer. Will have to ask them again. As we can see, bonus draws happen after the 4 dice are drawn. While Maria Hill isn't exactly a bonus draw, we can see that the precedent is set for us doing the draw 4 dice part of our turn wholly and completely, before triggering any extra effects. I believe rulings about Red Tornado, Kobolds and other draw triggers would back this up. In short, trained Agent is nearly impossible to trigger andgets us an unreliable benefit, as we still have to roll the character, and can actually prevent us from getting the character we want as quickly if we miss the roll causing the energy goes out of play for the turn. She is just the WORST of the Maria Hill cards. Common gives you prep on attacking characters and acts as blocker manipulation or ramp. Rare gives you effectively a Blue Eyes mechanic for shield characters, but even better, lets you choose after you draw your dice for the turn, not in the main phase global step of your opponent's turn. I do understand the pulling first, and refilling the bag if needed. The thing this thread made me question, is bringing a shield character from used without a character face on her die. That is what I was wondering about. Around here, it always seems to role a character!I do understand about the other two and will look at adding the rare. Page 19 of the rule book sets up the rule of thumb for characters needing to be fielded for their abilities to trigger, but the rule book has also always said that card text supersedes standard rule text so... In Detroit we have argued over this as well, I wholeheartedly want to take this as a when drawn ability but based on the Thanos ruling we are still playing this as one Maria must be fielded the second triggers the ability. I'm a big fan of the flood the forum with the same question as a community concept and we have multiple entries for this, don't hold back if you want an answer. 1. If a Maria Hill die is in Prep Area before the draw of 4 dies, trigger her effect or must be drawn from the bag? 2. You can roll and reroll the die (shield) from Used Pile, or only a single Roll of other shield die (not including any Maria Hill) and goes to the Reserve? 1. You are not drawing dice from your prep area, you only draw dice from your bag, so this could be during the draw step but could also happen due to other effects (like a KO'd jade etc). 2. It doesn't say to add a different shield character to your roll it's just roll them. So the added die will not get a re-roll. Did we ever get an answer on this from Wizkids, it could be the key ability for getting a shield control team going, or it could be as lackluster as it seems. Other new abilities have been introduced that don't require the character to be fielded (Fabricate etc). Except she doesn't draw an extra dice, she rolls a single die from a limited selection of dice from used one time. This also doesn't answer my question, did we ever get a ruling from Wizkids on this (as someone mentioned they submitted this question already). 1. You would not reroll the chosen shield energy die in the Clear and Draw Step. Refer to the Rule Book, Turn Order section: “Once you have rolled (and possibly rerolled) all your dice, place all of the dice you rolled into your Reserve Pool, keeping the same face up.”, meaning that the dice you roll and reroll during Clear and Draw don't enter the Reserve Pool until all the rolling is over, and Maria Hill says to roll the new die, and place it directly to reserve, bypassing all this stuff. 2. If you draw less than 4 dice during the Clear and Draw Step, and one of them is Maria Hill, you must refill your bag and draw the amount to bring you to 4 total – this game effect must be completely resolved before you start another. Then you may activate Maria’s ability. However, there may be no dice in the Used Pile. 3. RELEVANT POINT OF THIS POST - NEEDS AN OFFICIAL RULING: Does Maria Hill need to be active for this ability to occur? (a) Yes. Therefore, a second Maria Hill die must be drawn to trigger the ability. (b) No. The words “draw Maria Hill in a turn” can lead one to assume this is not a “while active” effect, just like how Thanos - Infinite and the new Fabricate keyword game effects are applied. I would also want it be clarified in the instances where I go to draw 4 dice and I draw her first. Do i immediately resolve her? I find I have only 3 dice to draw and refill my bag first or not? I know what everybody says but I can't begin to question intent. Rulebook clarifies that all 4 dice are drawn as one effect (even if technically a refill happens in between). Nothing else triggers until that is done. True, she's situational at best shield swarm, once. Finally! She does not need to be active. Hello, another Question about Maria Hill. I have in my bag only one dice, Maria Hill, i draw her, What happens first? -2 roll a die for used (shield character)?